One of the main things pupils will need to consider when thinking about a career is whether or not there will be jobs in this field in the local area. 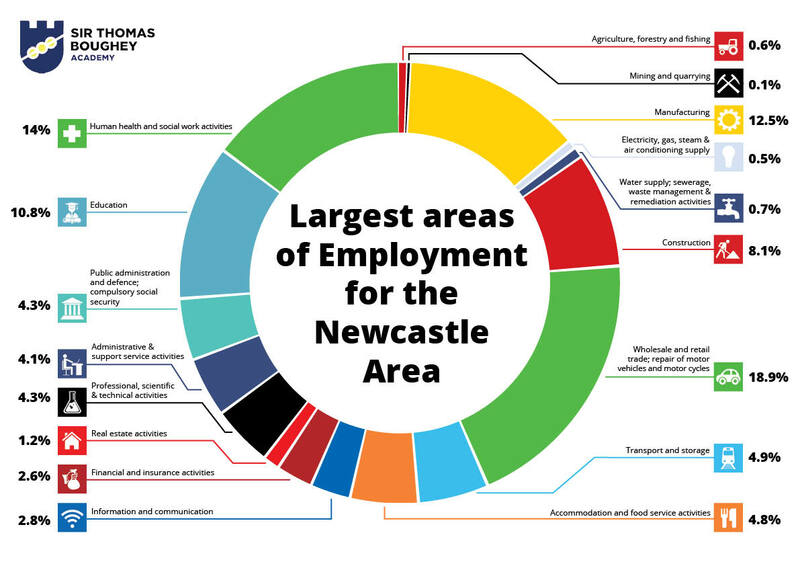 The chart below shows employment sectors in the Newcastle-under-Lyme area. This will give you some idea of the roles which are likely to be in high demand in the area. The school rigorously monitors the impact of the careers programme throughout the year and following students Post-16 destinations. The school’s next review of information will be published in January 2019. Childcare Apprenticeships talks – Y10 and 11 pupils were given an insight into the opportunities available in childcare and how to apply for a childcare apprenticeship. Key Stage 5 Evening – Y9 & 10 pupils will be able to meet colleges and apprentice providers to discuss their post 16 options. Leaders of the future – an event held by Stoke on Trent College for Head Boys and Head Girls. Pupils look at leadership skills through an interactive workshop. Rise Up Project – Year 9 pupils took part in a digital media project in which they created an advertising campaign designed to help solve a social issue. Five pupils were shortlisted to win this competition and travelled to Channel 4 studios in London to present their idea. National Citizenship Service assembly (Year 11). Pupils were given an assembly on an amazing opportunity for the coming summer. Orwell Youth Prize – a writing competition attended by Y11 pupils, aimed at budding writers. Employability skills workshop – Y10 and 10 pupils to take part in a workshop with the Davies Group focusing on CV writing and interview skills. Nu Futures – Y10 pupils will be working on employability skills. Mock Interview Evening – an opportunity for Y11 to practice their interview techniques. Talk from Gareth Hughes of Newcastle College – Gareth spoke to Year 11 pupils about how to make the best of their remaining time in school and get the best results in their GCSEs. Drop in sessions from Stoke on Trent College. Stoke on Trent College held a weekly stall in the library and were available to talk to pupils of any year group about the courses on offer. Volunteer it Yourself – a construction project where pupils learn about construction tools and techniques and build memory boxes for the local nursing home (y8, 9 & 10 pupils). Visit from Staff Sargent John Muir – pupils from years 10 and 11 interested in a career in the military were given information on army life, entry requirements, fitness, army jobs and army pay. Twilight Science Lecture – Y10 and 11 pupils watched a fascinating lecture on microscopes via live stream as a part of South Cheshire College’s Twilight Science lecture event. Success talk for boys – This was given by members of the Davies Group – a locally based company with whom the school is working in partnership (Y7, 8, 9 and 10 pupils). International basketball player and coach Shawn Jamieson to talk to GCSE pupils about sports and coaching careers. Work experience – all Y10 pupils complete 2 weeks work experience during the summer term. The United Endeavour Trust careers strategy is shaped by the needs of individual students, and, therefore, developing a strong dialogue with students is at the heart of the policy. 2. Is given in the best interest of the individual student receiving the guidance, taking into account their personal aspirations and needs. 3. Consists of a wide range of information on the availability of further education and training options, including apprenticeships and vocational pathways. Each academy will make it clear to students that they will be required to continue studying GCSE English and Maths post-16 if they do not achieve a grade C or better at GCSE in these subjects. Each academy will make it clear to students that although they must remain in education or training beyond the age of 16, they are not required to stay in a school. In an ever changing employment landscape, our curriculum strives to prepare our students to compete practically and intellectually, and make a positive and sustained contribution as members of a local community and a global society. We recognise the importance of preparing young people for participation in society as informed citizens, empowered to make changes concerning the issues that affect them and those around them. The development of personal and professional skills, characteristics and attributes is an integral part of our school’s curriculum to ensure students are exceptionally well prepared for the next stage of their education, training or employment with training. All students access a highly effective careers programme that supports students to make informed, realistic and intelligent decisions about all aspects of the next stage of their education, training or employment with training. stepintothenhs.nhs.uk – A guide for 14-19 year old students about careers in the NHS. russellgroup.org – a guide produced by the Russell Group of Universities to help you consider how the subjects you choose to study after year 11 can affect your future plans. university.which.co.uk – contains information about universities and choosing options after year 9 and 11.
apprenticeships.org.uk – search and apply for apprenticeship vacancies. vinspired.com – find volunteering opportunities for 14-25 year olds. do-it.org – find volunteering opportunities in your local area. plotr.co.uk – see the career worlds section to explore your career ideas further. icould.com – watch career videos. prospects.ac.uk – explore the careers you are interested in. This site also includes a section on options with your subject.